The Vinten Vision 8AS System with flowtech 100 Legs, Mid-Level Spreader & Case consists of a Vinten 8AS fluid head, a set of 100mm flowtech carbon fiber legs, a carrying handle, and a soft case. The system supports cameras weighing between 12.1 and 30.8 pounds. The Vision 8AS head features continuous— not stepped— counterbalance for precise adjustments and smooth operation. The sideload system provides a sliding plate for fine-tuning the balance of your camera on the head while allowing for quick mounting and dismounting of the camera plate. The 100mm flowtech legs are lightweight, corrosion resistant, strong, and feature a removable mid-level spreader and removable feet. The 100mm bowl enables supporting heavier camera loads than a 75mm bowl, and the increased diameter provides a wider platform for balancing your camera on the included head. Each leg features a single lever lock at the top which allows you to quickly adjust the length of the sections in each leg. Built into the bowl are three 3/8"-16 threaded accessory mounting holes onto which you can attach accessories. One such accessory is the included Sachtler Carry Handle, which enables you to comfortably carry your flowtech tripod and fluid head as you move from shot to shot. The included padded soft carry case protects your system during transport and storage. The Vinten V4045-0001 Vision 8AS Fluid Head is for shoulder mount camcorders up to 30.8 lb. This 100mm ball base fluid head offers an illuminated level, a side-load system for attachment, and LF drag control for a professional Vinten feel. LF Drag controls are numerically calibrated and feature a smooth professional feel. 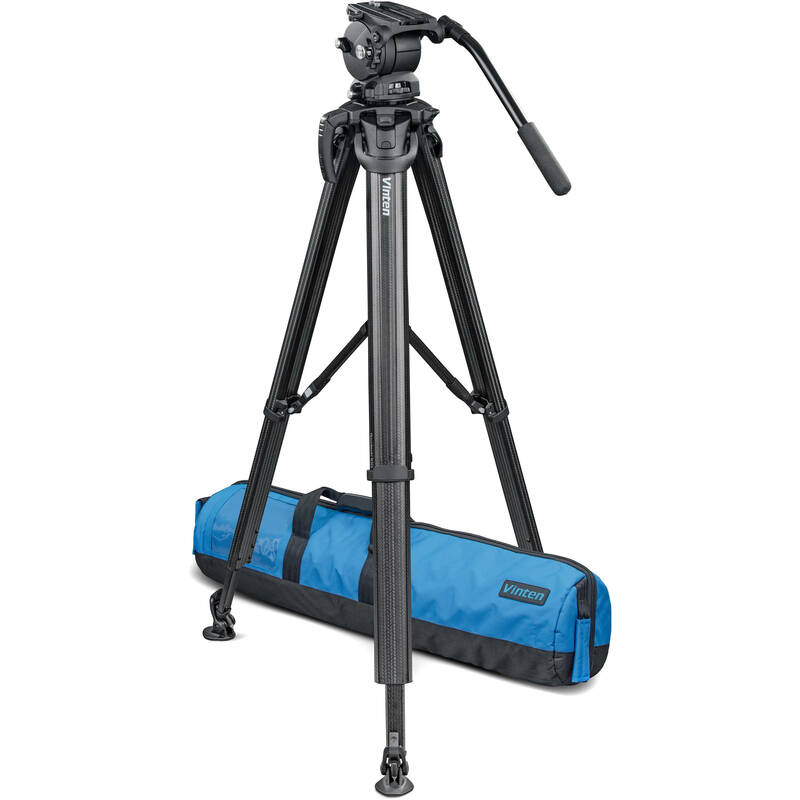 The Vinten flowtech 100 Carbon Fiber Tripod with Mid-Level Spreader and Rubber Feet eschews the common single or double carbon fiber tube design; instead, it has redesigned the shape of the legs for improved torsional strength. The legs weigh just over 9 pounds, including rubber feet and spreader, yet they can support a payload of up to 66 pounds, and extend from a minimum height of 20.5" to a maximum height of 61" when using the included removable mid-level spreader. Each leg features a single clamping lever that locks and unlocks the sections. The legs by themselves weigh only 7.01 pounds but support up to 66 pounds. Each leg features a single clamping lever lock design at the top of the leg, near the 100mm bowl. This allows you to loosen all three leg sections from a single location, saving you time while reducing the wear and tear on your body as you don't have to bend down to loosen a leg lock at the bottom to lower or raise the legs. With the spreader, the height range is 20.5 to 61". However, if you remove the mid-level spreader and utilize the built-in locking mechanism, the usable height range is 10.2 to 60.2". When closing the legs, there is room for the mid-level spreader to be folded up while remaining attached. The legs feature a magnetic locking system strong enough to hold them together during transport, but it also allows you to easily release the legs when you want to set them up. Box Dimensions (LxWxH) 18.0 x 10.1 x 8.2"
Box Dimensions (LxWxH) 42.5 x 42.5 x 9.5"